This graph shows the relationship between house prices (left axis) and the Incumbent Poll lead (right axis). As you can see lower house prices go along with a lower probability that the current government will be re-elected. 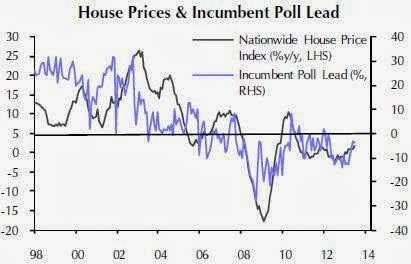 This of course doesn't mean that house prices necessarily cause the probability to change that the incumbent government will be stay in power. Remember correlation does not imply causation. Yet it is an interesting relation.